To commemorate 70 years of serving London and travelers around the world, Heathrow Airport has embarked on a new storytelling campaign to inspire travelers to share their memories, chance encounters, and more. Using a dedicated microsite, stories.heathrow.com, participants can fill in a few simple questions, including if they were flying to or from the airport, what was meaningful about the trip, the date, terminal number, and images. As a thank-you for entering, participants have a chance to win a number of prizes—all dubbed “birthday presents”—including Ray-Ban aviators, Thomas Pink Union Jack Cufflinks, or the grand prize: a trip to Australia on Qantas Airlines. Submissions are displayed on the dedicated microsite and on Heathrow Airport’s social media channels with the hashtag #LHR70. Stories range from the humorous (a woman who cut Colin Firth in the queue) to heartwarming (meeting the love of one’s life at an airport bar) and even heartbreaking—one woman learned her mother had passed away while in transit. Heathrow Airport is also sharing stories from its iconic employees, including 84-year-old resident photographer Dennis Stone. Dennis started working as a messenger boy at the airport when he was 14 years old and proceeded to photograph celebrities for the next 70 years, from Sir Elton John and Joan Collins to Rod Stewart and Princess Diana. In addition to the online storytelling campaign, portions of the airport also showcase stories and iconic moments in the airport’s history, from its opening in 1946 to today, where it boasts five terminals and serves 73 million passengers annually. So what can you learn from this successful storytelling campaign? 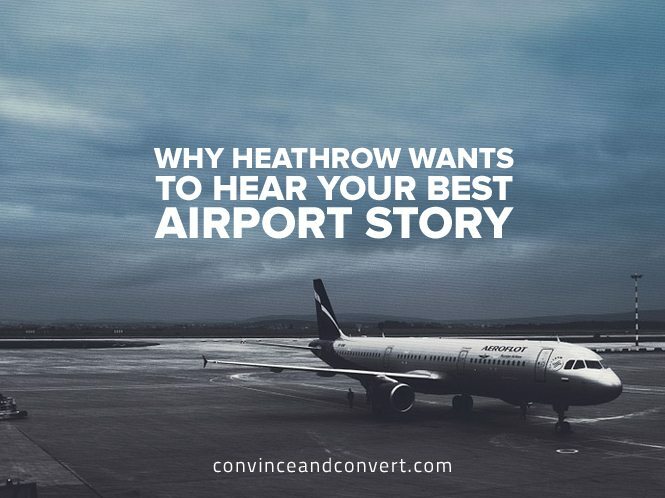 While Heathrow Airport’s campaign is highly positive and has generated some fantastic stories, the challenge is that not every company who runs these type of user-generated storytelling campaigns has the same experience. Before going full-throttle on user-generated storytelling, invest time in getting to know your audience. Are your consumers on social media organically sharing their stories, photos, videos, and other experiences? If so, do they skew positive or negative? User-generated campaigns will always be a mix of positive and negative, but if you’re trying to use a campaign to force a negative into a positive, it will not work. Instead, focus your time, budget, and innovation on delivering a better customer experience online and offline first. This one seems obvious, but it’s worth emphasizing, as not all companies factor in the user experience when asking consumers for content or stories. Take a page from Heathrow’s playbook here with a simple and easy web destination, supplemented with a social media call-to-action and supporting hashtags. With consumer attention so fragmented, being able to participate quickly and easily will result in more submissions. The clever idea to send “birthday gifts” as a contest prize to travelers who share their stories is also a plus. While a prize or freebie is not essential to cultivate user-generated content, having a broader prize pool and awarding prizes to the best submissions typically results in a higher level of quality. For companies with physical locations, look at how Heathrow leveraged its terminals to raise awareness for the campaign with its own historical facts. (Confession: It’s actually how this writer first learned about the campaign.) If you serve 73 million travelers annually, it’s hard to beat your own real estate in terms of platforms for raising awareness. To truly take it to the next level, consider leveraging digital screens to pull in user-generated content in key areas to inspire more travelers to participate in the moment while they have free time.